Is something eating your plants and flowers? Do you see large holes with mounds of dirt beside them? If so, you might have a groundhog problem. 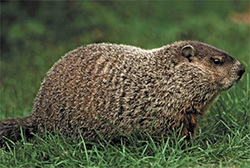 The groundhog, also known as the woodchuck, is a common nuisance animal in SE Michigan. They can devastate a garden or expensive landscaping. They often dig burrows under decks or next to houses and chew on underground cables and wires. They are very brazen and can often be seen “sunning” themselves on people’s decks and patios. The groundhog is a member of the squirrel family. It has brown to grayish brown fur and a stout, chunky body with short legs. Its front claws are well versed for digging and its tail is short and bushy. The average groundhog weighs about 5 to 10 pounds with a total length of about 16 to 20 inches. Like other rodents, groundhogs have chisel like incisor teeth. Although they are slow runners, groundhogs will quickly scamper to their dens when they sense danger. Groundhogs are strict herbivores that feed on a variety of vegetables, grasses and fruits. They prefer foods such as soybeans, carrots, beans, peas, alfalfa and clover. 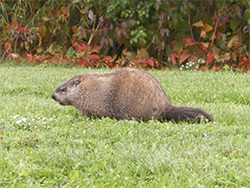 Groundhogs prefer to feed in the early morning and evening hours. Breeding season is March and April with babies being born in early to mid May. The average litter size is 2 to 6 babies. Babies are weaned by late June to early July when they will leave the female and strike out on their own. They will sometimes occupy abandoned burrows for the summer before digging a fresh burrow for the winter. Groundhogs are one of the few mammals that truly hibernate. Hibernation starts in late October or early November and continues until late March to early April. The best way to control groundhogs is by trapping and relocating them. After the animals have been removed, dens should be filled in with dirt. Decks can be screened with a “rat wall” by digging a trench around the deck about 1 foot wide and 1 foot deep. Bend the screen in an L shape and fasten the screen to the deck with staples or screws. After the screen is fastened, fill in the trench. Fencing can be used to keep groundhogs out of gardens. They are good climbers so fencing should be at least 3 to 5 feet high and made of heavy screen or poultry fence.